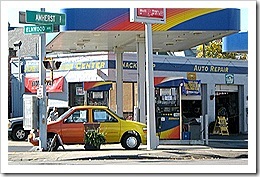 Joe’s Service Center is located at the eastern entrance to the Grant-Amherst Business District and at the northern portal of Buffalo’s Museum District and Elmwood Village. 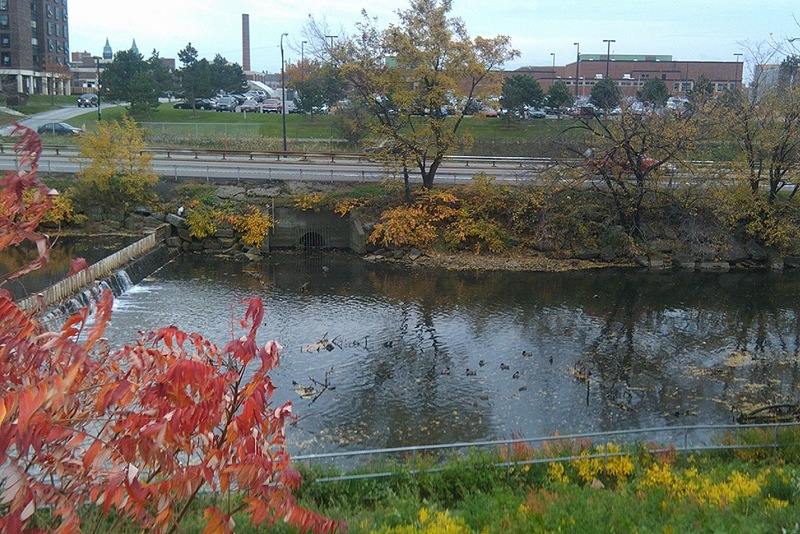 Buffalo State College and the Scajaquada Creek and bike path are part of the neighborhood. Proprietor Mark Kubiniec is a community activist and environmental advocate who now serves as president of the Grant Amherst Business Association. Joe’s Service Center proclaims the unique nature of the neighborhood with the AutoMobius parked at the corner of Elmwood and Amherst. Across the street from Joe’s is the historic Voelker’s Bowling Center, often described as “classic Buffalo.” And a few doors away is Wegman’s Supermarket, whose award winning design was the prototype for the chain that is regularly rated as America’s “best place to work.” Buffalo-owned Tops Supermarkets anchors the corner of Grant and Amherst. Heading towards Grant St., the buildings show signs of Amherst Street’s heritage as part of Black Rock, Buffalo’s oldest neighborhood. It played a prominent role in the war of 1812 with portions burned to the ground by the British. Black Rock was the rival of Buffalo for the terminus of the Erie Canal, but Buffalo, with its larger harbor capacity and greater distance from the shores of Canada won the competition. Black Rock took its name from a large outcropping of black limestone along the Niagara River, which was blasted away in the early 1820s to make way for the canal. Today the neighborhood is multi-cultural and a home to many new immigrants, but its old ethnic heritage shows in places such as Spar’s European Sausage, Nick’s Place (a noted Greek breakfast diner), the Polish Cadet’s Hall and the Ukrainian American Civic Center. The neighborhood is also an emerging arts corridor, with the 464 Gallery featuring emerging artists, Artsphere Studio and Gallery, stained glass artists and even a recording studio. A huge new mural dominates the Grant-Amherst intersection. New entertainment ventures are springing up, surrounding the venerable Sportsmen’s Tavern, a showcase for local musicians. This nucleus of activity makes the neighborhood a newly adopted gathering point for artists and art supporters. The neighborhood is also proud to host the Habitat for Humanity Buffalo ReStore which sells quality new and used furniture, appliances, building materials, and household items at a fraction of normal retail prices. Items sold by Habitat for Humanity ReStore are usually donated from individuals, building supply stores, or contractors who wish to show their support for Habitat’s mission of volunteer work to build new homes for those in need. 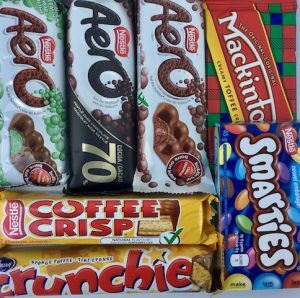 In addition to raising funds, ReStore helps the environment by rechanneling good, usable materials into use. The Scajaquada Creek watershed originally provided drainage for a mixed rural landscape with farms. 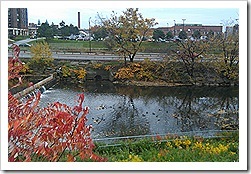 The watershed now provides drainage through a densely populated, mixed residential, industrial, and commercial environment that includes the Galleria Mall, Buffalo-Niagara International Airport, Forest Lawn Cemetery and the Elmwood-Grant-Amherst neighborhood where it is bordered by a scenic bike path. The spring-fed creek is a local link with green space, outdoor recreation, and wildlife. Mark heads the Scajaquada Creek Canoe Club, and each year leads a group of hands-on environmentalists is cleaning up the creek of urban debris. He also works on regular tree plantings along the main streets of the neighborhood and environmentally friendly landscaping. The neighborhood is the home of Buffalo’s major museums. The new Burchfield-Penney Art Center is a museum dedicated to the art and culture of Western New York, including the world’s largest collection of works by Charles E. Burchfield. Exhibitions and programs include art and design from the Buffalo Niagara region, historic and contemporary. An outstanding center of modern and contemporary art, the Albright-Knox Art Gallery collection belongs among the world’s top international surveys of 20th century painting and sculpture. The Buffalo & Erie County Historical Society displays everything from artifacts from the Pan-American Exposition to souvenirs from the Buffalo Bills’ 50 years as a National Football League franchise. The Elmwood Village is Buffalo’s premier shopping districts. Its tree lined commercial streets offer a diverse collection of over 200 locally owned and operated retail stores. 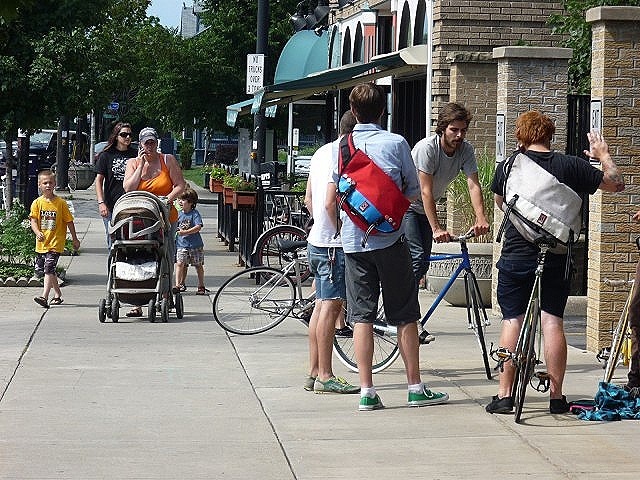 Elmwood Village was recently voted one of ten great neighborhoods in the United States by the American Planning Association. The neighborhood’s main thoroughfare, Elmwood Avenue, is a funky but chic strip of shops, boutiques, restaurants and bars with merchandise ranging from distinct clothing and eclectic jewelry to specialty gifts and quality toys. Elmwood has many neighborhood gathering spots, including Talking Leaves Books, Spot Coffee, Cole’s, Pano’s Restaurant, J. P. Bullfeathers and the Lexington Food Co-Op. 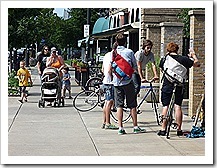 In the spring, summer and fall, Elmwood is the home of the Bidwell Farmer’s Market every Saturday morning. In August, a festival featuring local art and organizations is held. The Elmwood Village is what city life is all about.